I first heard about this mysterious drink over the summer and decided to try it for myself. My first experience was…let’s just say very interesting. The smell was unfamiliar when I took a quick whiff, and the hiss accompanying taking off the cap signified the carbonation, but it left me unprepared for my first sip. My taste buds were overwhelmed by the carbonated liquid resembling a taste somewhere between cider and vinegar with a twang. I was brave enough to take a second sip and eventually I was able to finish the bottle. Shortly after that experience I decided to give another bottle a try because I had heard about its health benefits, and I’ve been hooked since. Kombucha is usually black or green tea that is fermented by adding sugar and some bacteria and yeast. The bacteria and yeast feed on the sugar for at least a week, allowing it to ferment. 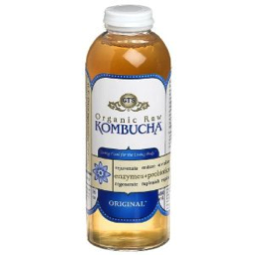 The benefits of Kombucha result from the bacteria in the tea, also known as probiotics. You might have heard of probiotics supplements or about probiotics being in yogurt. While bacteria are usually given a negative connotation, humans actually have bacteria in their digestive system that aids in digestion and the production of nutrients. There have been claims made that Kombucha aids in cancer prevention and other diseases, but there is little research to support these claims. Don’t take my word for it; you can try Kombucha for yourself! Martins and the Friendly City Food Co-op both sell Kombucha, and I even know some people who make it themselves! Talk about Kombucha Krazzzzzy.